I spent the two last years of my dad’s life traveling the globe for a job, a lucky perk with terrible timing. My world expanded as Parkinson’s disease shrunk Dad’s world to a hospital bed and the cracks in the ceiling. I’ve learned this lesson again and again: Life’s good sometimes comes mixed with the unspeakably awful. My father, a blur in motion as I grew up, who had earned the nickname “waterbug” at work because he couldn’t sit still, who took me as a teenager to Los Angeles from our home in Tulsa for a weekend just because, lived his last years trapped in a shaking body, his jaw slack, eyes glazed. His interest made me think of his old photo albums, stacked in a cabinet with their wedding photos and other memorabilia of my parents’ lives before marriage. Before anyone called him Dad, my father had joined the Air Force in 1954, working as a mechanic stationed at Sculthorpe Royal Air Force base in England. Whenever he had personal leave time, he went to see another country, and the photo albums gave us glimpses of what he saw. I remember square black-and-white photos of Dad skiing in the Alps, and him squinting at the camera on a gondola in Venice, Italy, shirts and pants dangling from a clothesline above his head. He carried that love for travel throughout his life. After the service, he worked as an airline mechanic for American Airlines, and took Mom, my sister and me on trips to Hawaii and Florida and New York using the airline’s non-revenue or “non-rev” program that allowed employees and their families to fly for free on stand-by. “I’ve never been to Africa,” Dad said when I had told him Senegal on the west coast was my next stop. I heard yearning behind his words, as if he wished he were beside me, and I felt deeply sad that his health had shut that door. Even though I spent most of my time in a Dakar hotel conference room, but my dad thrilled as if I’ve been going on safari. I collected impressions of that sunbaked seaside city to share with him and Mom: the tall slender woman in colorful dresses and head cloths, men talking on cell phones and leading goats on leashes through the city streets. How the hotel’s plumbing only provided cold showers. How the sky turned red at dawn. It was September, and tents full of sheep and rams with curled horns dotted the main roads in advance of the Muslim holiday called Tabaski. Stories and souvenir T-shirts became my way of sharing the experiences with my father. Mom said he wore the T-shirts to his many doctor’s and physical therapy appointments, and they acted as conversation starters for my friendly father who always had kind things to say to everyone he encountered. 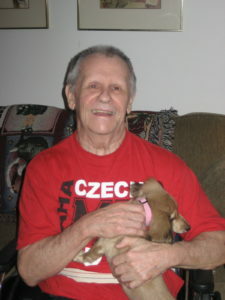 His favorite shirt was a bright red one I bought him in Prague that read: “Czech me out.” His parents had emigrated from Czechoslovakia in the 1920s. For Dad, it didn’t matter that the country’s split in 1993 meant his parents’ hometowns were in Slovakia, not the Czech Republic. He’d grown up saying he was Czech and he loved the wordplay. In between my trips, I also traveled see him in Houston almost every month. Dad’s health worsened. He slipped away from us in an increasingly wordless sorrow. His eyes stayed unblinkingly open for long periods but at the same time lacked focus, often looking upward. He still smiled but hardly spoke as I talked to him from Toronto, Canada, and after that trip, I spent most of the next two months in Houston while my father did the work of dying. Every day, he drifted further and further away from us. I imagined him living some kind of active mental life, free of his body, traveling through the world and seeing all of the parts he had missed. After he died in December 2012, I took trips to South Africa and Malaysia and China. I visualized him at each place with me: watching a pride of lions walk by our jeep on safari, baking in the heat of Malaysia’s red-painted town of Melaka, walking on top of the Great Wall of China. His spirit felt strongest in London, about two-and-a-half hours from the air base where he was stationed. Through his eyes, I imagined him as a young man from a small town in Pennsylvania watching the changing of the guards at Buckingham Palace or sampling the chaos of Trafalgar Square. He still travels with me today. Thanks for reading it, Bernie. It made me happy to share this bit of him with you. 50 years Lynn it is with a warm feeling in my heart and tears in my eyes that I just finished reading this ever so beautiful and personal memory of your father, John that you so graciously shared with all of us. It was heartwarming and heartbreaking at the same time! I remember John with a big smile always and always loving his family!! You were his life Laura and Lynn and your mother was the love of his life..
Know in your heart Lynn that your dad is smiling down from heaven at you right now and beaming with pride ! Thank you Penny! You are such a dear family friend. Aww, thanks Anissa. My warmest childhood memories intersect with you and your mom and dad. So touching…especially now, for me, as I plan my annual trip to visit my parents who are well into their senior years. Thanks for sharing. It can be hard as parents decline in health, Melanie, but I treasure those visits and time spent now he is gone. Lynn, what beautiful tribute to your dad. He was so proud of his girls, those of us who knew him well always have a special place in our hearts for him. Thank you, CoeAnn. You are always such a kind light and loving support. Oh, Les, it wasn’t five months after my Dad died that we were at your father’s funeral in Tulsa. Hugs and love. My beautiful sister, what would I do without you? I am deeply touched as I remember well my beloved husband, now realizing what affect fathers have on their children’s lives – through your beautiful words. Thank you for sharing! Thank you for reading it, Anne, as you approach a five-year anniversary of your own. Sometimes it takes me a while to see things clearly…or more clearly anyway. Beautifully written!! I loved reading about your dad, some of my best memories was our parents playing cards and all of us getting to play. Listening. To 45’s on the record player…. Thanks for sharing those memories, Linda. It gave me a smile. Such a beautiful tribute to your Father! Thank you, Kathi, for letting me share my memories of Dad with you. Hi Lynn, I was one of the therapists that worked with your Dad for quite a while in Houston. He was always so will big to try, to work to get better and I grew incredibly fond of him and your beautiful Mom. You’re not supposed to have “favourites “ but I did and he was it. Years have passed but I think of him often, such a lovely man and with such s great smile. I’m so glad I got to hear some if his stories before he was unable to tell them any more. 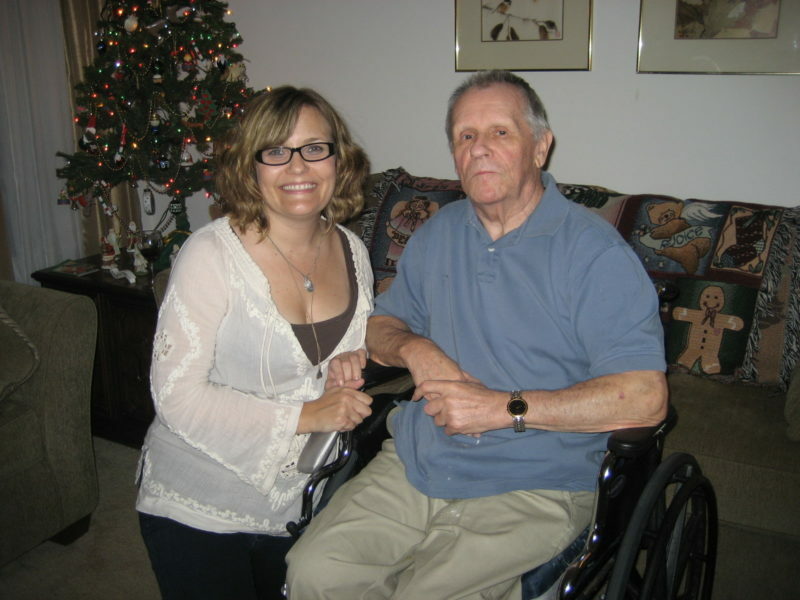 Kim, thank you for sharing your experience with Dad in PT. I love hearing about your feelings for him and the impact he had.